All images are printed with pigment inks on archival 100% cotton paper and matted with acid-free materials to ensure long life. Images are available framed or just matted. 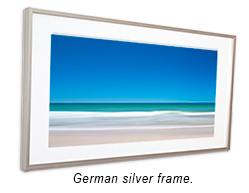 Framed pieces are framed with framing grade non-glare plexiglass and a Nielsen-Bainbridge metal frame in German silver, a warm neutral tone that complements the images and any decor. You may order online via a secure shopping cart or by phone. To order online, choose your print and click on the shopping cart icon in the lower left corner of the page and then select the size you want. The checkout process is similar to other shopping carts. You will receive an email receipt and confirmation after placing you order. Your order will be shipped by UPS and you will be emailed tracking information after it has shipped. If you prefer to purchase images in person, please check my show schedule or contact me to arrange an appointment at my studio.